A long time ago, back in the day when pots and pans could talk (in fact, they still do), a farmer used to walk up a long, long winding path to fetch water everyday in two pots. One day a crack developed in one of the pots and a bit of water leaked out on the long journey home. Over time the crack in the pot widened. One day, the pot cried out to the farmer, "Everyday you fill me up and everyday I leak all the water out and am empty by the time you get home. Please! Replace me with a better pot!" The farmer thought a moment and then he spoke. "Yes, everyday I fill you up and everyday you leak. But when you leak, you water all the wild flowers from the well all the way home to my door. One side of the path, where I carry you, is lined with beautiful wildflowers. On the side where I carry the perfect pot, the path is lifeless and barren." The farmers smiled at his broken pot and said, "I think I’ll keep you." Unfortunately, I did not get to keep my little blind Rhode Island Red hen. Scarlett passed away this morning in my arms. She was a very good chicken. I will love and miss her always. 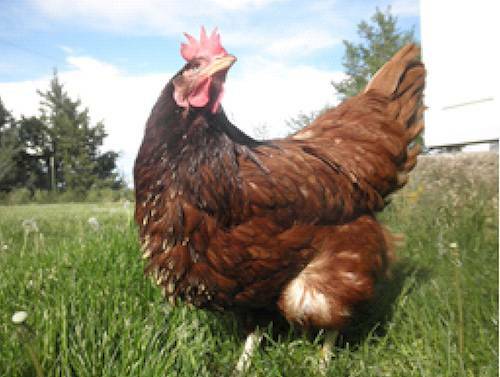 Scarlett, my precious blind Rhode Island Red hen was a rescue from a feed store. Her opthalmalogist thought perhaps a virus may have induced her blindness. She was wonderful! Scarlett slept on my hand, resting on my chest every night for the last three years. I still have a hole in my heart.